In 2008, an unexpected but very welcome opportunity came my way: The chance to study towards a master’s degree in art and design with AUT (Auckland University of Technology) while based on my residential Polynesian island of Atiu (Cook Islands). Though quite challenging and nerve-racking at times, it made me grow and transcend my boundaries. My final exhibition Third Space was shown in February 2010 at the Takamoa Mission House on Rarotonga. 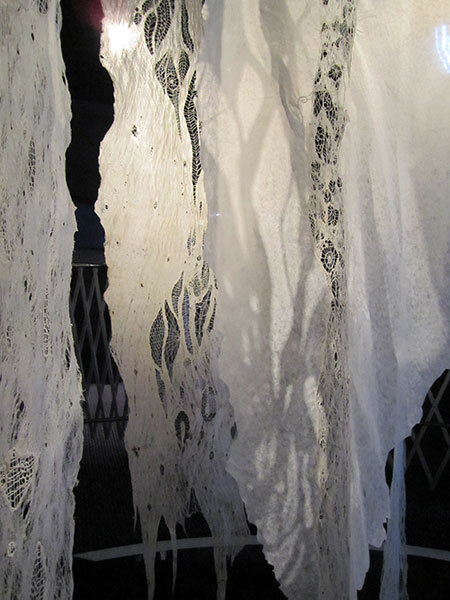 It ultimately opened the way to my participation in the international Lace Award competition held at the Sydney Powerhouse Museum from 2011 to 2012/13. 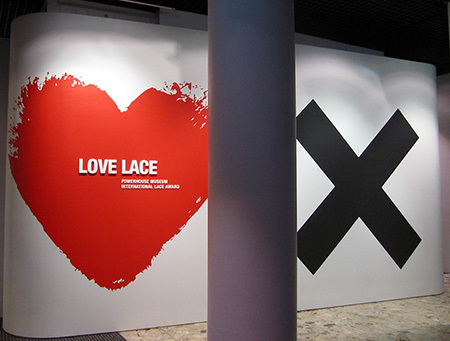 The opportunity of participation in the Powerhouse Museum’s Love Lace Award Exhibition presented me with a great chance to use what I had learned from the Rarotonga exhibition. I liked that I could take this work in a similar form to Australia, another country that is known for its migrant history. I enjoyed the challenge of installing its components in a completely different optical and physical environment that would ultimately result in giving it a completely new face and feel. 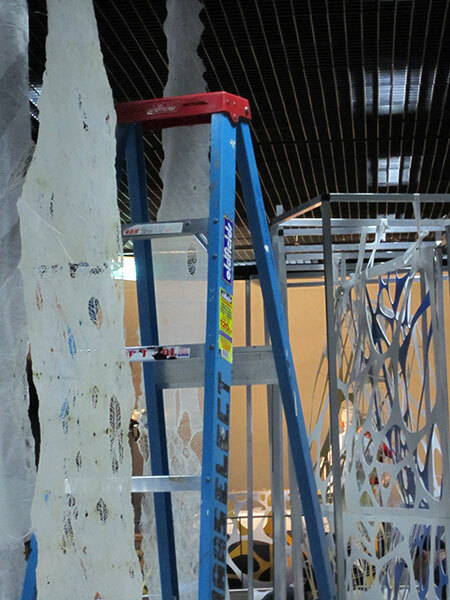 I was fortunate that the Museum allocated space for me at the restoration laboratory to prepare the 35 individual elements of the installation (above left) for hanging. 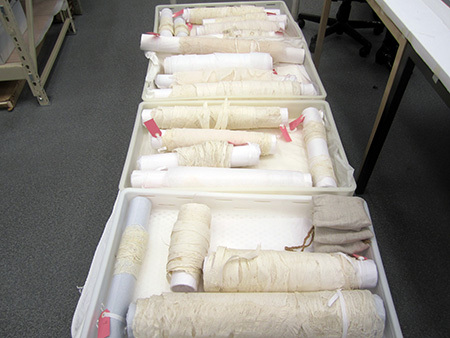 The Museum’s multi-ethnic group of textile conservators soon made me feel like ‘part of the family’. Working alongside professionals gave me an interesting glimpse behind the scenes and into a well-equipped lab (above right) and the large construction workshop of this impressive museum of applied arts. It was quite an eye opener to learn how much work goes into keeping exhibits in good conditions. I also got an insight into the intricacies of organizing exhibitions in the museum itself and lending collections to other museums in the country and overseas. Living on a remote and rather basic Polynesian island has made me self-reliant and creative. It was wonderful to be surrounded by helpful and resourceful people who assisted with anything I needed to display my work in the best possible manner. 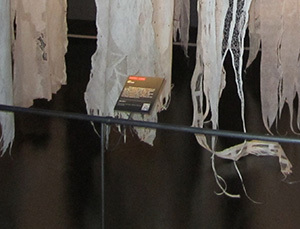 Third Space II was installed (left) in record time thanks to my previous experience and the superior facilities that the Powerhouse Museum offered. The museum has an enormous number of daily visitors, many of them children. Therefore, unlike in my exhibition on Rarotonga, viewers cannot be allowed access to the space inside the installation itself and the work is surrounded by a guardrail (right) .This prevented part of the intended sensory experience, but it gave me the opportunity to make more use of the floor as additional exhibition space (below right). To make up for that, I had planned for a further element to become part of the work: The addition of sound. I had chosen the clicking sounds that Atiu Swiftlets make when they use echo location to navigate the total darkness of their nesting cave on my island. The museum’s audio engineer managed to make it sound so real that I had to look up repeatedly to check that the tiny birds were not actually flying above our heads. Thanks to the lighting expert’s magic, the lace’s patterned shadows (above left) add to the mysterious feel of an inner space that the black-painted environment enhances. 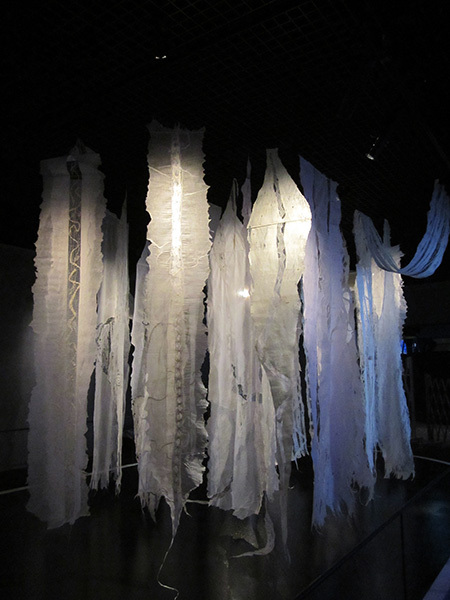 For me it has been a huge privilege to have been allowed to present my installation in a new environment. I thank the museum’s curator Lindie Ward, Joanne Delzoppo and all the wonderful people who I had the joy to work with for their help in making this dream come true, especially for making me feel so welcome during my several weeks’ stay in Sydney. Meeting an old friend, Rosemary Shepherd OAM, again, whose dedication to lace, I believe, laid the foundation for this event, was a highlight of my stay. I thoroughly enjoyed engaging with a number of international fellow lace artists, being able to ‘talk art’ with them and to have stayed in touch. Thanks to the involvement of the Cook Islands tourism office, my installation has also provided an opportunity to help promote my beautiful island country as a destination worth visiting. A lot of encouraging feedback has come my way. I can see how much potential this Third Space idea still offers. Now I have but one dream: To be invited to take the installation to other countries, to add to it, to alter it, to study its adaptive transformation in new environments, and to ultimately be able to show it in my native Germany as the other end of the scale that encompasses the components of my Third Space.